She’s next. She’s been folded into something that supernatural forces want, and it looks like she’ll have no choice in the matter. 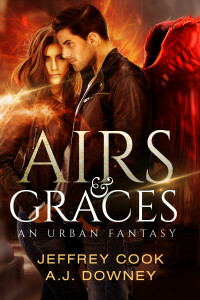 In a run for her life and a race in which the involvement of the Devil himself is considered among the least of their worries, Addy must find enough moments of calm to unfold the Angel’s Grace inside her, learn from the visions it provides, and find the keys to Heaven and Hell. I got out and almost doubled back over with the pain that lanced through my chest at the act of straightening up. He put his hand on my back and ushered me up the sidewalk and up the steps of a house just down the block from my car. It was brick with a wrought-iron decorative gate out front and the white Greek columns like so many others down either side of the street. He let the gate clang shut behind us and led me up and through the front door like he lived there, and as soon as I crossed the threshold I was assaulted by the booming and gunfire of everyone’s favorite first person shooter emanating from a living room off to my right. The big-screen TV was split into two screens, and two men sat on a sagging leather couch in front of it, game controllers in hand. One had turned to look at us, his fiery red hair in a loose ponytail, his face tan and handsome with a chiseled jaw line and lovely hazel eyes. He looked like he should be on the football team, with how broad-shouldered and muscled he was. I couldn’t say what the other looked like, as I just had a view of the back of his head; his hair was shoulder-length and black like Tab’s, and from what I could see of his neck and shoulders he wasn’t as built as the redhead. The redhead was the first to speak, and his voice was deep and rumbled out of his broad chest in a genial way. “Hello, Tab, who is this?” he asked, but before anyone could respond, the slighter man next to him spoke without turning around. I looked away from them and back to Tab to see what he thought of the exchange. His face gave away nothing. I swung back around at the sound of cloth sliding against leather to see the other man hanging over the back of the couch, his cornflower blue eyes traveling up from my feet in a slow sweep, definitely pausing longer than what was appropriate at my hips and again for even longer at my chest. I already didn’t like him much. “Tabby Cat! What did you bring us?” he asked, and I turned back to Tab, his mouth definitely turned down in an expression of disapproval. “Tabby Cat?” I asked him, and he just shook his head. “There’s no time for this. Where is Michael?” he asked the two on the couch, and it just sort of clicked in my brain. “You mean to tell me that’s Gabriel? The Gabriel? And that he’s Uriel?” I said, gesticulating at the two on the couch. “I mean I suppose I can get my head around him being one of the Archangels, at least he’s built like one,” I said pointing at Uriel, “but this yahoo?” I asked, indicating Gabriel. “Michael is upstairs; let me get him for you,” Uriel said, rising to his feet. I expected him to go for the stairwell with the dark wood banister against the wall in front of us but I was sadly mistaken, instead he drew a deep breath and shouted “Michael!” but it wasn’t a normal shout-across-the-house thing. I jumped with the force of it, feeling my bones creak as I clapped my hands over my ears. His voice rolled through the house like thunder. None of the other men—er, Angels?—were even fazed by it, but it brought tears to my eyes. Uriel shrugged apologetically and sat back down, resuming his game against Gabriel. I gasped and almost fell to my knees, the breath knocked clean out of me by what I saw. His wings were so beautiful, arching high, bright, and white behind him, the long feathers dragging the steps as he came down. But this wasn’t right; I was in a frat house in Seattle. I blinked, and he was standing halfway down the steps in his expensive gray pants and white shirt, wingless but no less lovely, a queer expression painting his features, like I had just done something fascinating, but then the other vision wavered back over everything. I closed my eyes tight, and it was a mistake: the vision became all the more clear. Michael was saying something to someone, and I turned to my right, but instead of there being the couch with the game system there stood three more Angels, Uriel in copper chainmail, his wings pure white and bathed in a golden glow, and beside him another whom I didn’t recognize, a brunette, and then Gabriel, his hair much longer but with the same bored expression of only moments ago. I didn’t understand. What was happening to me? I must have said it out loud because a hand closed on my left arm, where Tab was standing, and I turned, and that is when I let out a scream, a short, high-pitched bleat of terror. There was more than stone flooring this time; a large stone table stood there. It was horrible, the stone drenched in blood and heavier, wetter, things… I fell to the floor and scrambled backwards in a crab walk away from the scene. The man chained to the table at ankles and wrists shouldn’t have been alive, but he was, straining at the chains screaming silently, his eyes wide and angry, his black hair longer than it had been a moment ago, matted with his own fluids to the side of his face as he whipped his head around and stared me straight in the eyes with his own liquid gray ones. I knew him, sort of. It was Tab, and that’s when I started screaming again… only this time I didn’t stop. I screamed loud and long until the world went black, and I didn’t have to see it anymore.